This weekend I decided to try something different with dinner. With ingredients I already had in the fridge I created a simple marinade that gave amazing flavor to a simple piece of salmon. Putting everything together took almost no time and it tasted amazing! ***Soy Sauce (in my case Gluten Free soy sauce). Mix the liquid ingredients together to taste and add on to the raw salmon steak. Marinade the salmon in "teriyaka" sauce for a minimum of 1 hour. Sear salmon on a skillet until cooked through, add remainder of sauce mix on top of the salmon while cooking. If desired, you can add sauce after the fish is plated. 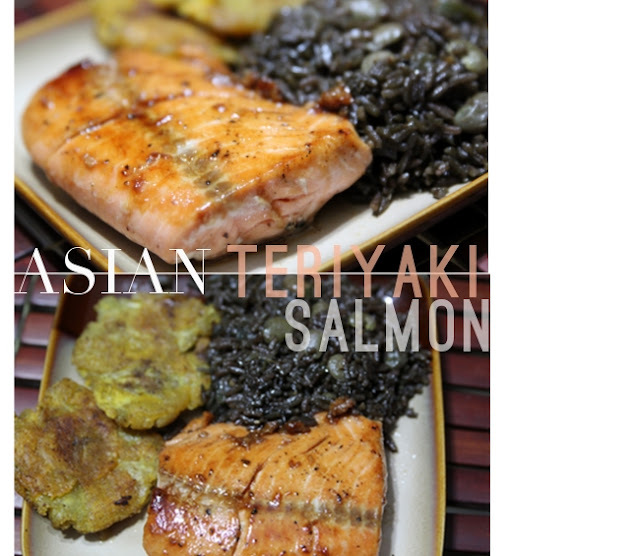 I paired the salmon with a traditional Haitian dish called djon djon rice and some fried plantains. Next time I'll keep with the Asian theme and make some stir fried bok choy as a side. What I like about this marinade is that it makes the perfect base to build on. I can add chili oil to make it a bit more spicy. I can also experiment with ginger, cilantro or any other flavors I fancy. It looks so simple to do! And I knew I recognized my favorite haitian rice! Were you born in Haiti or you learned to cook here? @Loica12- I was born in Haiti but I didn't learn how to make djon djon rice until last year. Now I make it all the time!